When you're Exit Real World, you throw three birthday parties. The first show was the little one. Out in the suburbs, lots of drunken teens. Salem went second and hosted 9191, complete with Jake Price, Austin Smith and Curtis Cizek. Now for the grand finale. Friday, October 22 Portland's Mission Theatre (1624 NW Glisan) will host Exit and show Think Thank's Right Brain, Left Brain. Just 5 bucks at the door gets you the movie, a sneak peek at Exit's new skate team video and undoubtedly a chance to do ridiculous things to win prizes. In Salem they even had a pie-eating contest. Close dude won. Far dude said the pie tasted like crap. 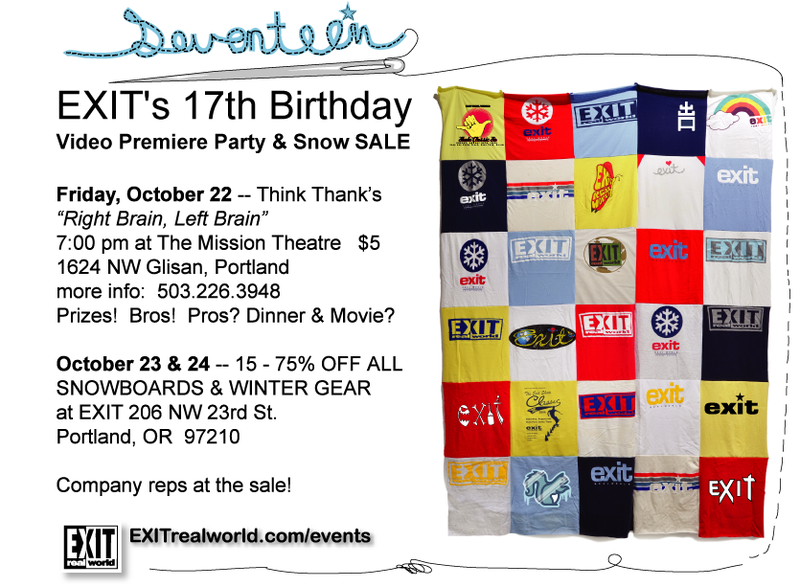 Oh yeah, don't forget, biggest sale of the season at Exit's Portland location on NW 23rd the Saturday and Sunday following the show. Somewhere between 15 and 75% off any and everything. How about a picture of the flier? OK!